Credential managers are now be able to easily customize, send out, and log their Letter of Appointments, all within Silversheet. This is another great digital workflow efficiency feature, saving you time and hassle. First, you'll want to head over to settings to fully customize the Letter of Appointment for your organization including uploading your logo and editing the default language. We made the letter template straightforward to edit and tailor to your needs. When you're done, click the "Preview" button and you can preview your customized Letter of Appointment. Once your Letter of Appointment is customized, it'll be available to you to send out everytime you finish processing a new appointment. To do this, you'll want to go to a provider's profile, go to their "Appointment & Privileges" tab. Since we use the Appointment Term within the letter, you'll need to define the Appointment Term dates before you can print or digitally send out your Letter of Appointment. After setting your Appointment Term and completing your credentialing workflow, you're ready for the final step of the sending out your Letter of Appointment. 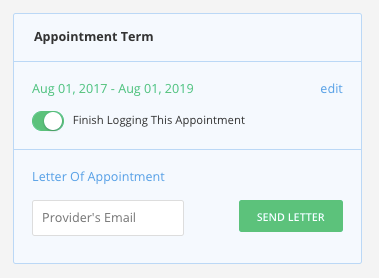 Under Appointment Term, just switch the toggle to "Finish Logging This Appointment" and you'll be able to share the letter with your provider. That's it! From here, you can either print out your custom Letter of Appointment, or email it out digitally through Silversheet. When you email it out digitally through Silversheet, we automatically log the Letter of Appointment for you as part of your set of this appointment's Approval Documents.